This is NOT your typical abs program and this plan is not just a bunch of repetitions of core exercises. We built this program for results, and the combination of core, HIIT cardio, and strength training is not only great for building a lean, toned stomach or six pack, it’s also effective for allover toning, reducing body fat, improving cardiovascular endurance, increasing lean muscle mass, functional strength, agility, coordination, flexibility and balance. With these workouts and a healthy diet, you can definitely see drops in body fat and scale weight. A heavy emphasis on the abs, obliques and lower back, combined with HIIT and total body strength training, helps lower body fat, flatten, tone and define the midsection. The carefully constructed day by day plan uses our full length workout videos to weave total body strength and toning routines and varying intensities of body fat reducing cardio in with a blend of dynamic abdominal exercises to not only tone up those muscles that are residing underneath any excess body fat, but also to burn off the fat layer they're hiding under so that you can see the product of all of your hard work. This program also aims to build a stronger core which will benefit you, your fitness goals, & your quality of life in ways far beyond the superficial goal of a flatter stomach. Workouts are scheduled five days a week (three weekly core intensive workouts, roughly every other day), and average out to 31 minutes a day. Dumbbells are used throughout the program & are recommended but not absolutely necessary & you can always improvise. There are almost no repeat workouts in this program; you do a different workout video almost every day. As an added bonus, your core is not the only muscle group that's being targeted; with the very dynamic exercises found in these workouts, you are likely to see rapid changes in your belly fat and tone, as well as in the rest of your body. Make sure to take "before and after" photos so that you can see the difference in 4 weeks! 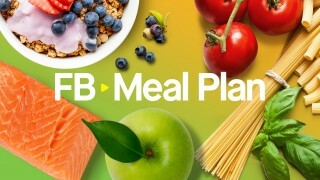 We encourage you to use #FBabs on social media to track your workout sessions, share your progress, find motivation, and connect with people around the world who are following this program. Combining this plan with other programs: This program has five scheduled workouts a week, three of which intensively target the core (typically days 1,3, & 5 of each week long span, labeled “Core Intensive”). This leaves you with 2-3 days a week to train other parts of your body. This program fills those days with a combination of strength training and/or various types of cardio (the most effective training types for reducing body fat), meaning that you can use this as a standalone program, however, if you want to combine this program with another one of our plans targeting another training goal or muscle, you have the option of doing only the 3 “Core Intensive” workouts a week and combining this program with our other programs. You will not need or want to do any additional workouts targeting the core (extra workouts for these muscle groups may actually hinder your progress - it's a myth that you should work your abs every day). It takes a lot of self-directing and listening to your own body, but you can pair this with another Fitness Blender Program, just keep in mind that our more intensive plans with a heavy emphasis on strength training and HIIT may be overkill in combination with this program, unless they are modified. As mentioned above, you could use just the core intensive portion of this program (typically days 1, 3 & 5 of each week) to completely burnout your abdominals, in conjunction with another one of our programs. Difficulty level: Though we always encourage each person to listen to their own body's messages and move at their own pace through the workouts, the routines in this plan are relatively intense and start out at difficulty levels 3-5 from day 1. This is not a low impact program. Exercisers will need to use their own discretion in manipulating the scheduled workouts to be appropriate for their personal fitness levels & abilities. Exercisers are encouraged to take liberties in manipulating this program to work for their needs. We encourage you to use our Community or #FBabs and #fitnessblender on social media to track your workout sessions, share your progress, find motivation, and connect with people around the world who are following this program.